As if your bucket list wasn’t already long enough, here’s one to slap right at the top: backpacking in the Grand Canyon. Few hiking destinations are so coveted as this world wonder—famous for jaw-dropping beauty and notorious for leg-burning trails. 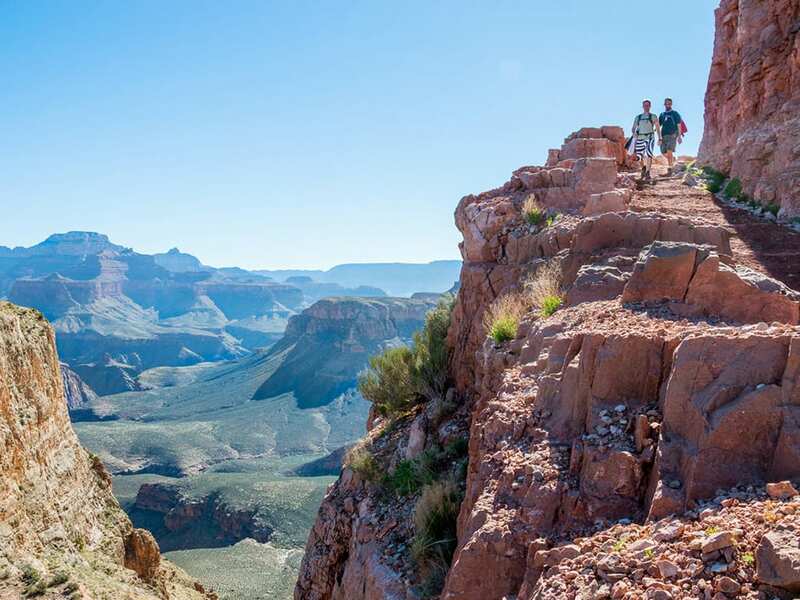 Overnighters here aren’t for everyone, but with fitness and a bit of desert hiking experience, you can explore the depths of Grand Canyon in a way few ever do. Yes, it’s intimidating, but this guide will make the journey easier by getting you properly packed and on the trail, which includes working through the national park’s tricky permit system. This is the most important part, because failure to plan will wreck your trip before it even starts. You should pick a route that is rewarding but feasible. First timers might want to stick to the corridor trails because they are maintained and easy to follow, yet don’t sacrifice any scenery. The catch is that campsites along these trails can fill up (read about permits below). Backcountry camps must be arranged in advance, so you need to plan your daily mileage and be able to stick to it. In general, expect to go slower in the Grand Canyon than you would elsewhere. Not only because you’ll be stopping to take in vistas and smell the cactus flowers, but because hiking here is really hard, and that’s no understatement. It’s especially slow going in the summer, when heat takes a major toll. Backpacking here is good year round, but the season makes a big difference, with scorching summers and freezing winters. Water is scarce any time of year, however, so this is crucial to plan for. Some trails have no water, and others have sources that must be treated before drinking. Your route will dictate how much carrying capacity and which treatment methods are necessary. This information is available from trail descriptions and backcountry maps. A permit is necessary for anyone camping below the rim, and it specifies trip leader’s name, number in the group, and night-by-night itinerary. You can reserve a permit up to four months in advance. You must print and fill out a request form, and the only way to submit is via mail, fax, or in person—no phone or email. Once your permit is granted, the cost is $10 plus $8 per person per night. Besides the trek itself, this is the hardest part. You must reconcile weight savings and preparedness—not a simple task. Necessity number one in the canyon is water, followed closely by food, so don’t skimp on either of these. In this desert environment, consuming electrolytes and calories is just as important as drinking water, so don’t forget to eat. Another key to preparation is knowing your route backwards and forwards. Time of year, water availability, daily mileage, and campsite amenities determine what you should bring and what you can leave at home. If all your water sources will be potable, save the weight of filters. Some campsites have toilets while others do not. A few even have picnic tables and food boxes. If you plan to stay in more primitive areas, you must bring more materials to pack out waste, critter-proof food, and camp comfortably. Take the time to research trails, campsites, and weather conditions before you go. This will pay off when you know exactly what to bring and, perhaps more importantly, what not to bring. Steps 1-3 can go out the window within a matter of minutes. 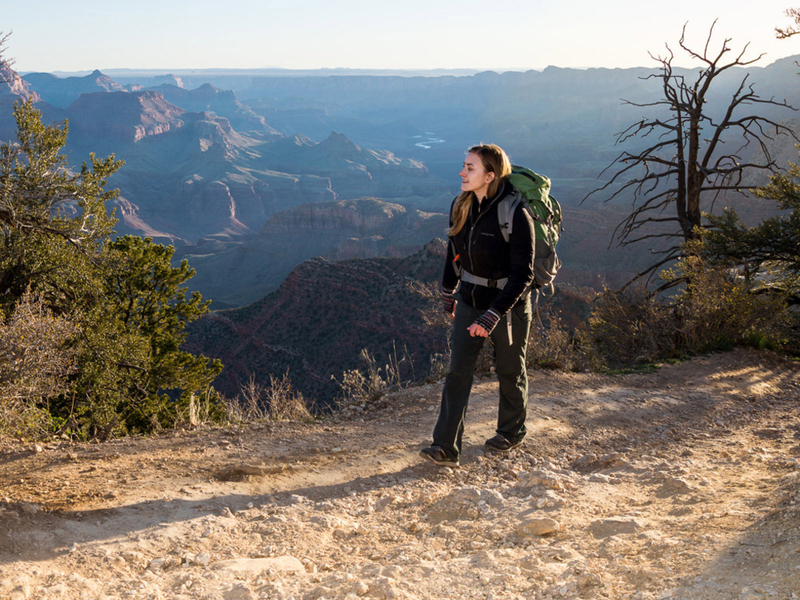 Especially if it is your first time backpacking in the Grand Canyon, expect the unexpected. Thunderstorms pop up often in the summer, and snowstorms in the winter. Water sources may dry up due to freezing or drought. Trails may seem to suddenly disappear. You may get cramps, roll an ankle, or simply find the terrain surprisingly difficult. In the Grand Canyon, which is up to 6,000 feet deep, it’s easy to get in over your head. This is no reason not to go, however. You just have to understand that hiking here is more difficult than in many other places, so you should be conservative with your goals and wide open with your expectations. Maybe you will show up, throw down, and bust it back to the rim with perfect weather and happy trails, and know you could have handled something harder. Such good fortune just gives you more time to relax and enjoy the depths of the canyon. Remember that out of the millions of visitors who visit this national park each year, only a few earn the experience of sleeping in seclusion beneath its grand walls. So get on that bucket list and get out there! Written by RootsRated for RootsRated in partnership with Superfeet.